We are continuing this week with our “Book & Boogie” ONLINE VIDEO SERIES, where we feature stories with music and movement! We are featuring a new “Book & Boogie” video each day this week to kick off the series. So far this week, we featured our Warm up & Cool down, and fun story / music combinations about dinosaurs and trains. Next up, we are going to meet a duck named Ruby, and learn a song and movements to “The Little White Duck“. We will feature one of the videos each day this week on our blog … but you can also have easy access to the ENTIRE collection at www.bookandboogie.com. 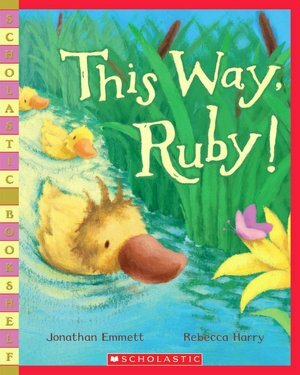 Ruby’s brothers and sisters are always racing off in search of adventure. “This way, Ruby!” they call, but Ruby, who is still the littlest, likes to take things slowly. She prefers to look at all the grassy banks, the willow trees, and the dragonflies, which is just as well, for when the ducklings get lost in a storm, it’s up to Ruby to find the way back home!